Redmi note 7 launched in china but first time they come with a sub bran "redmi by xiomi".The main key highlight of this smartphone was a 48 megapixel camera. 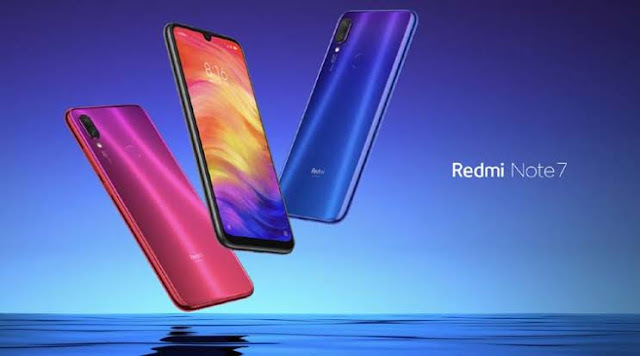 Redmi note 7 come with waterdrop noch 6.3 inch Display.Redmi note 7 launcher in three variants 3/4/6 Ram or 32/64 Rom.The Redmi Note 7 come with a very effective price starts from CNY 999 (roughly Rs. 10,300) for the 3GB RAM + 32GB storage variants or CNY 1,199 (roughly Rs. 12,400) for the 4GB RAM + 64GB storage ad last one CNY 1,399 (roughly Rs. 14,500) for the 6GB RAM + 64GB storage option. Redmi note 7 Running on MIUI 9 based on Android pie. Note 7 has 6.3-inch full-HD+ (1080x2340 pixels) LTPS display with Corning Gorilla Glass 5. The smartphone is powered by the 2.2GHz Snapdragon 660 octa-core SoC paired with Adreno 512 graphics. Bad news for dual sim user with memory card.They provide only Hybrid sim slot.so you can use dual sim or you use one sim and memory card.